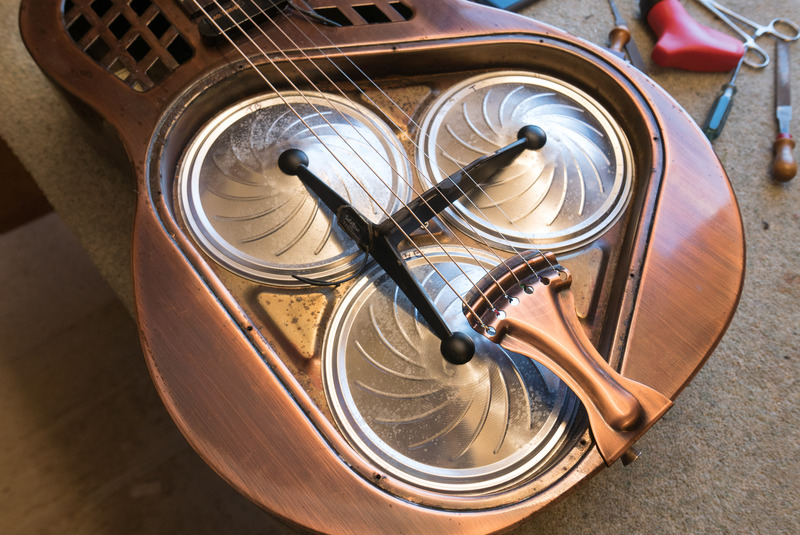 This guitar, a Recording King Tricone Resonator, came into the workshop with a problem. It’s owner, guitar virtuoso Roland Chadwick, wanted to use an open C# tuning (C#,G#, C#, F, G#, C#) but couldn’t get it to play in tune. A web search rapidly revealed that these guitars are notorious for giving trouble with open tunings. There are probably several reasons including the high action at the nut and coupling of certain notes with strong body resonances, but another cause seems to be too little compensation at the bridge. With an open C# tuning, this results in the two lower strings sounding more than 20 cents sharp at the 12th fret. 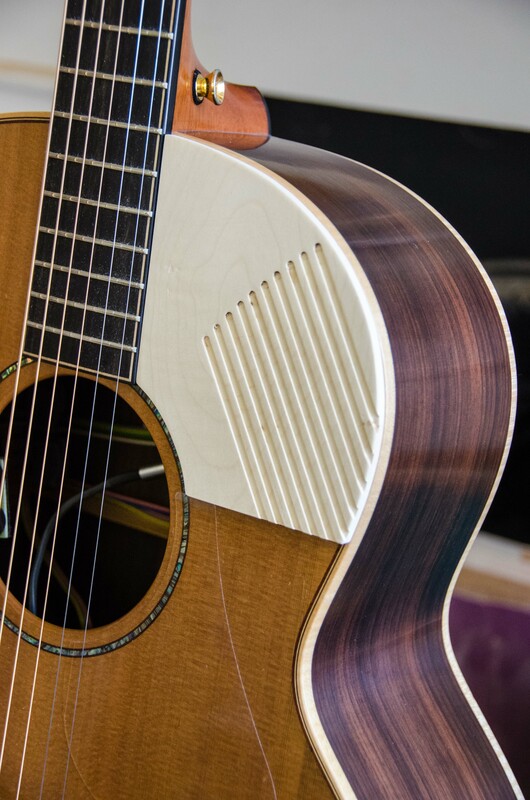 At one time, a replacement bridge was made which allowed the compensation of each string to be individually adjusted. (You can see it here.) It looks an excellent design but unfortunately, it’s no longer obtainable. What to do instead? I decided to follow a similar route but to get there by modifying the existing bridge rather than making a new one. I simply glued small pieces of ebony onto it and reshaped the string slots to provide a few millimetres of compensation for the 2nd, 5th and 6th strings. 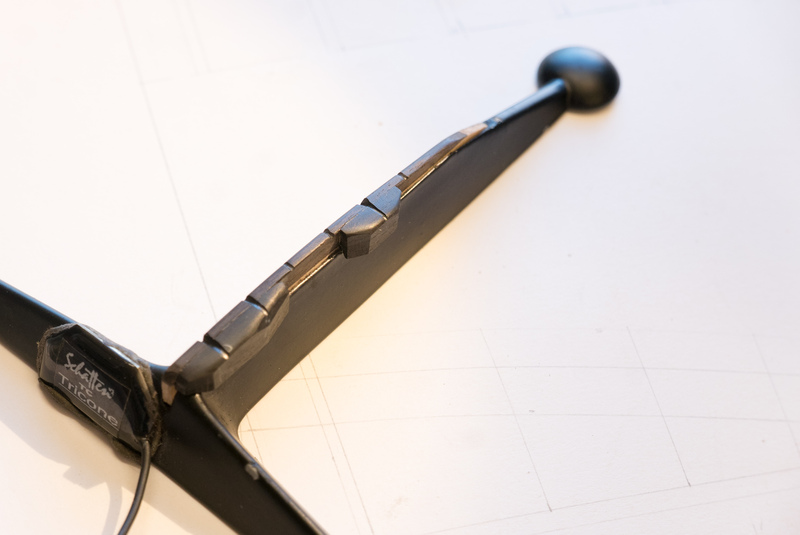 I say simply but, although the idea is straightforward, it’s a bit tricky in practice because the shape of the bridge and existing saddle makes it hard to clamp the small lumps of ebony in place while the glue cures. 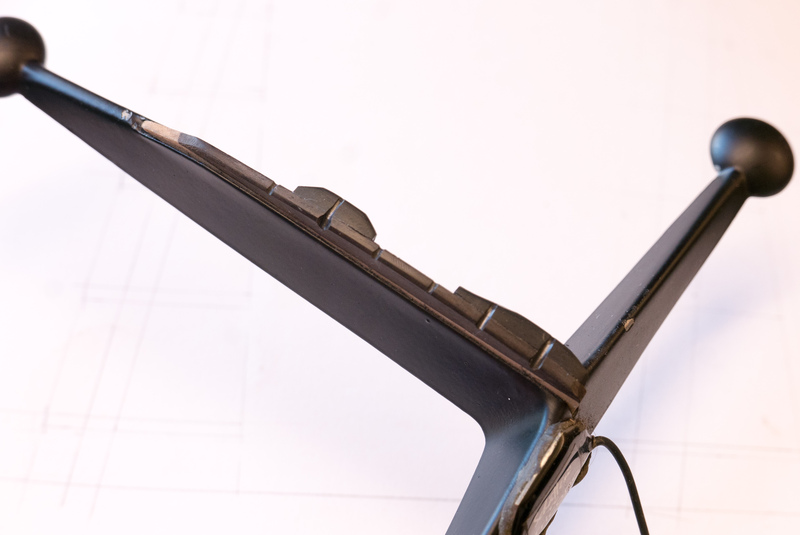 I solved the problem by making a cast of the opposite side of the bridge from car body filler – a technique that I’ve described in detail in the Tools and Jigs section of this website. 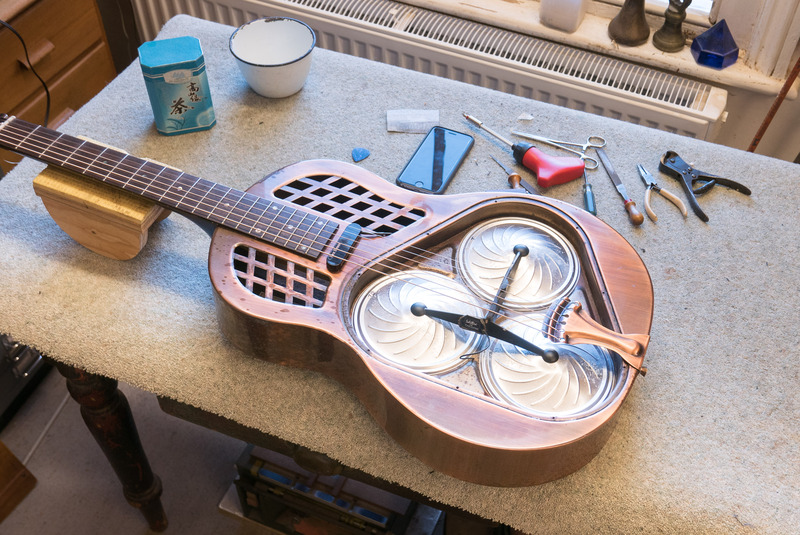 Below are a few photographs of the modified bridge and the guitar with its top off while final adjustments were being made. I didn’t succeed in getting it to play perfectly in tune over the whole length of the fingerboard, but the intonation is a lot better and I think that Roland will now be able to play it without making his audience’s ears bleed. 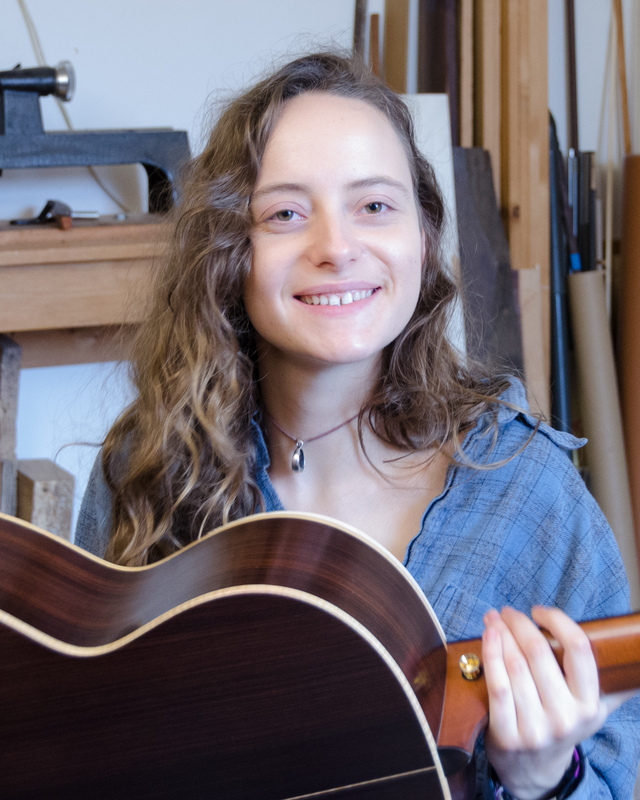 It’s always a pleasure to hear what one’s instruments are doing and I recently caught up with this small steel-string guitar that I made nearly 5 years ago for Poppy Smallwood. 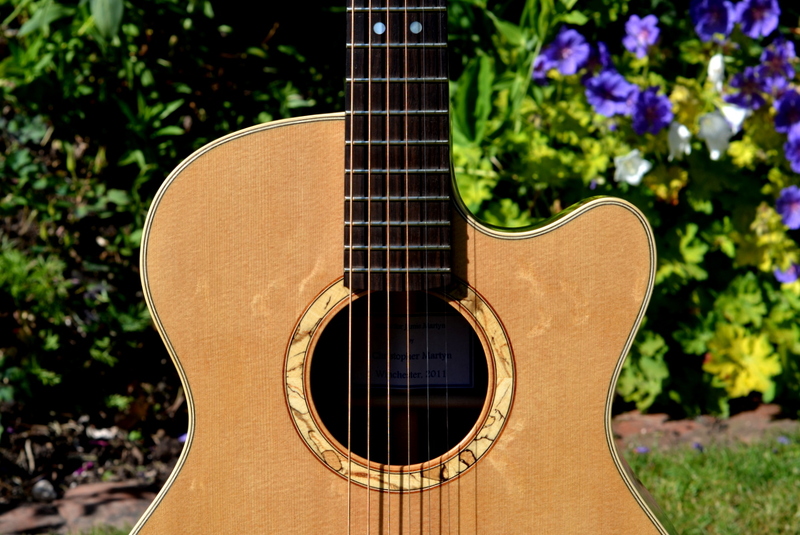 Based on a Martin OO model with 12 frets to neck, it’s made of English walnut and has a sitka spruce soundboard. Poppy has been playing the guitar in all sorts of places, making a reputation for herself as a singer and songwriter. Here she is performing one of her own songs for BalconyTV against the background of St Petersburg. You can hear several more of her songs on Soundcloud. 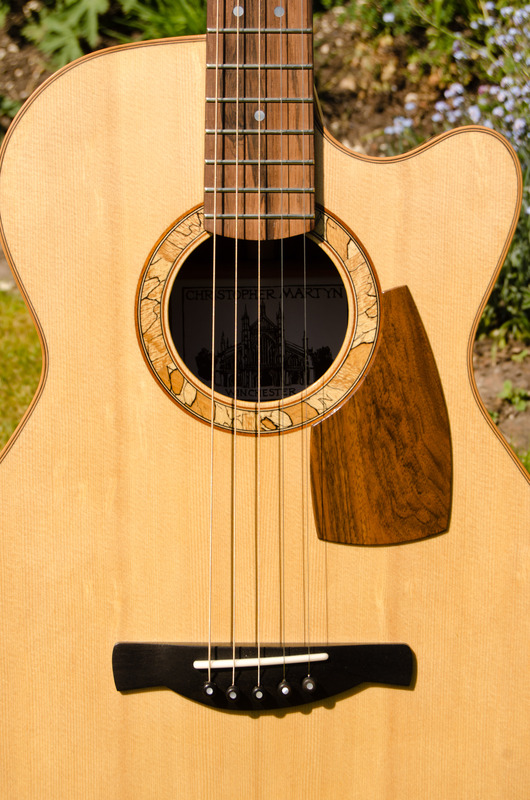 Steel string guitars often carry scratch plates or rather anti-scratch plates to protect the soundboard being damaged by vigorous strumming. These plates are usually made of plastic sheet. Although they do the job well enough, I’ve always recoiled from the idea of sticking plastic on top of a beautiful piece of spruce. 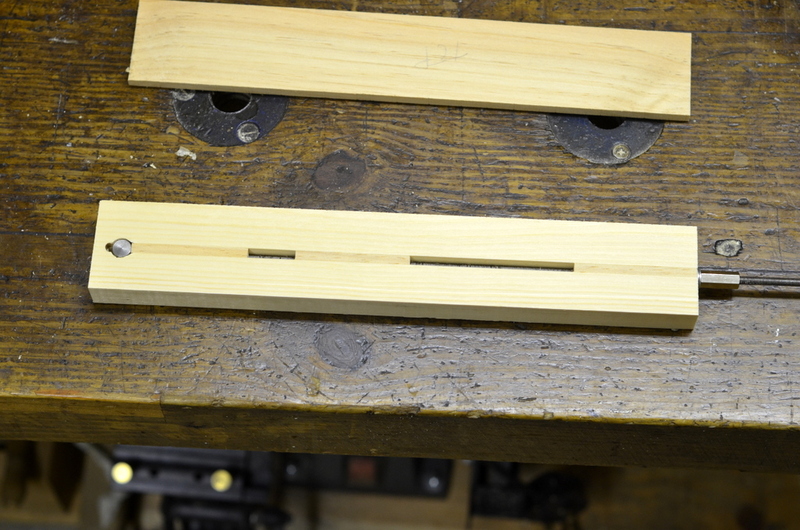 Why not make one from an off-cut of the wood used for the back of the instrument? 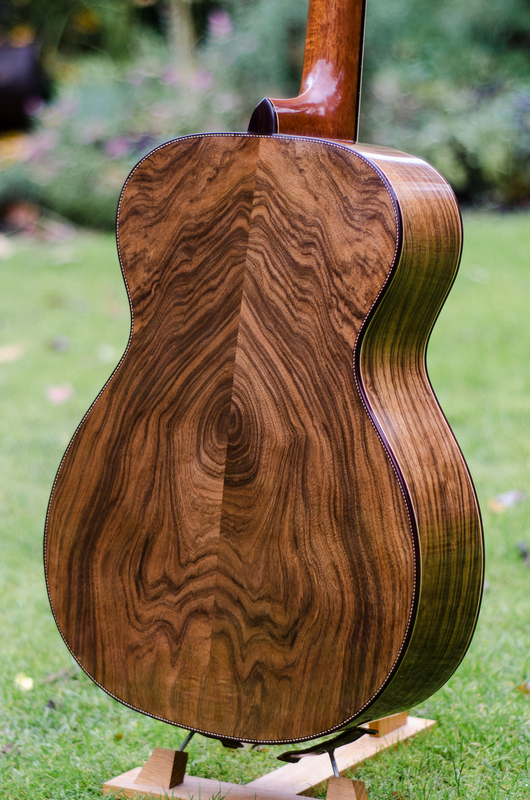 Here’s one of walnut on a guitar that I made last year. But guitarists who like to play percussive finger-style want scratch plates for an entirely different reason – not to protect the soundboard from inadvertent damage but as an extra facility to increase the number of different sounds they can get out of the instrument. If you don’t know what I’m talking about, try these YouTube links to Mike Dawes and Thomas Leeb. 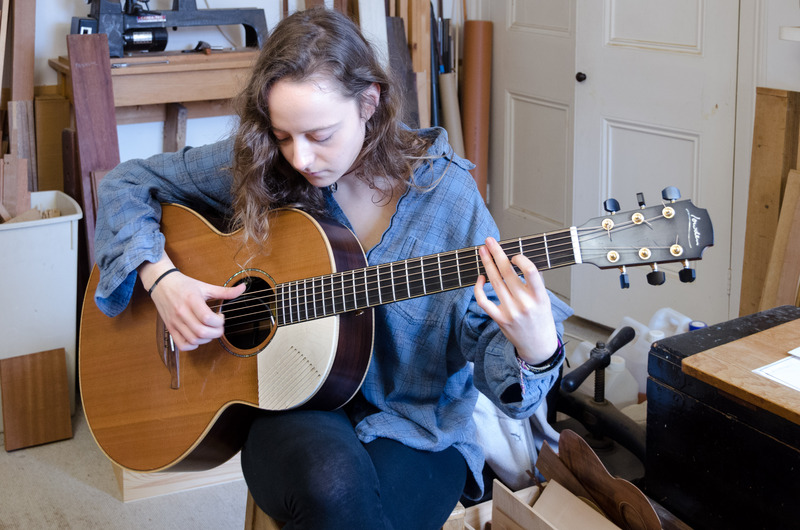 A couple of weeks ago, Darcey O’Mara, a talented young guitarist from Brighton, brought me two guitars that needed adjusting and setting up. She also asked me to make scratch pads for them. After a bit of experimentation with different sizes and different textures, we reckoned that a combination of smooth and grooved surfaces offered the most potential. 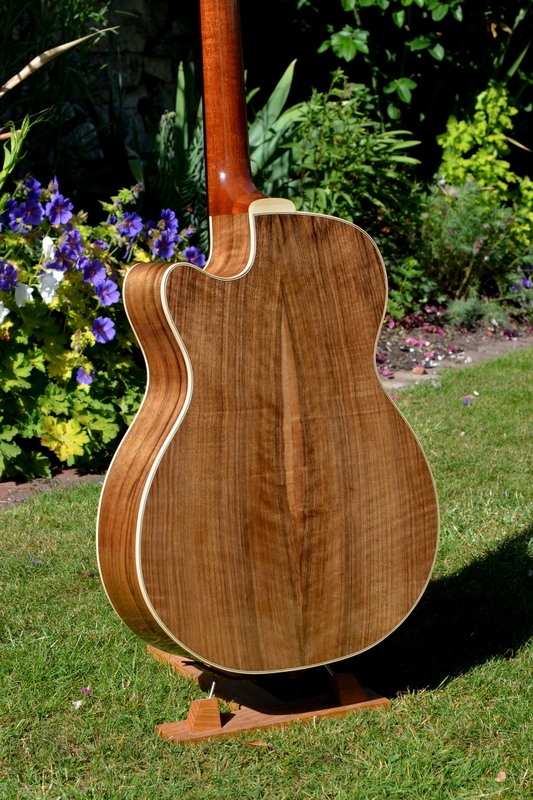 Here’s a maple pad fitted to Darcey’s cedar topped Lowden guitar. 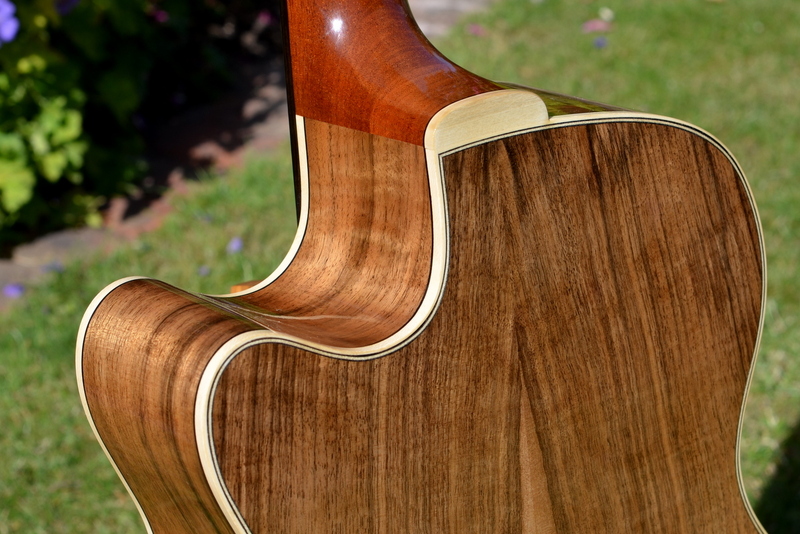 And here’s something similar in mahogany for her Takamine cut-away. … with some satisfaction, it seems. It was said, by none other than Keith Richards himself, that his discovery of open G guitar tuning was a revelation. (See here for more.) He certainly had a lot of successes with it including Honky Tonk Woman, Brown Sugar, Can’t You Hear Me Knocking, to name but a few. Richards usually took the bottom E string off a six string guitar and then tuned the remaining strings to GDGBD. But a guitar player from New Zealand, Tim Cundy, who also plays with open G tuning, thought that he’d like to have an instrument especially designed for this tuning and asked me to make him one. 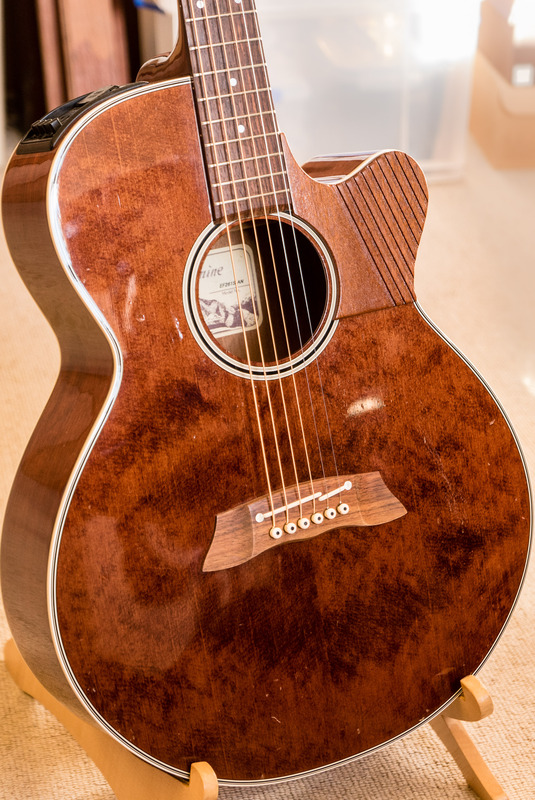 Here it is: about the size of a Martin OO, with a cutaway and 12 frets to the body. 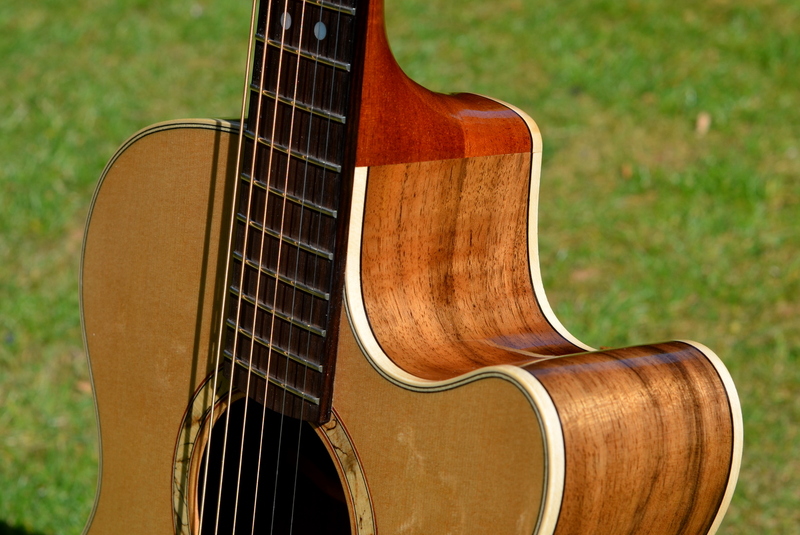 It’s made in English walnut with a Sitka spruce soundboard. The rosette is spalted beech and the headstock veneer is spalted applewood. It’s bound with pearwood and the purflings are ebony. Having established, to my own satisfaction at least, that it would be asking for trouble to make a steel string guitar without a truss rod, the next question was which type to use and whether to arrange to get access to it at the top of the neck or the heel. 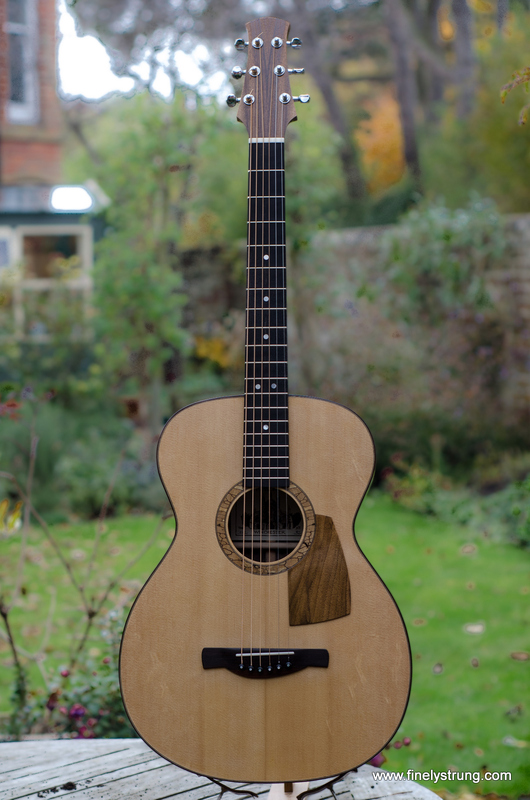 My friend Peter Barton, who makes beautiful steel string guitars in Yorkshire, recommended the Hotrod, which is a 2 way adjustable truss rod available from Stewart-MacDonald and looks like this. But there were a couple of reasons why I had misgivings about this device. One was that it weighs over 100g and I thought it might make a small or medium sized instrument too heavy in the neck. 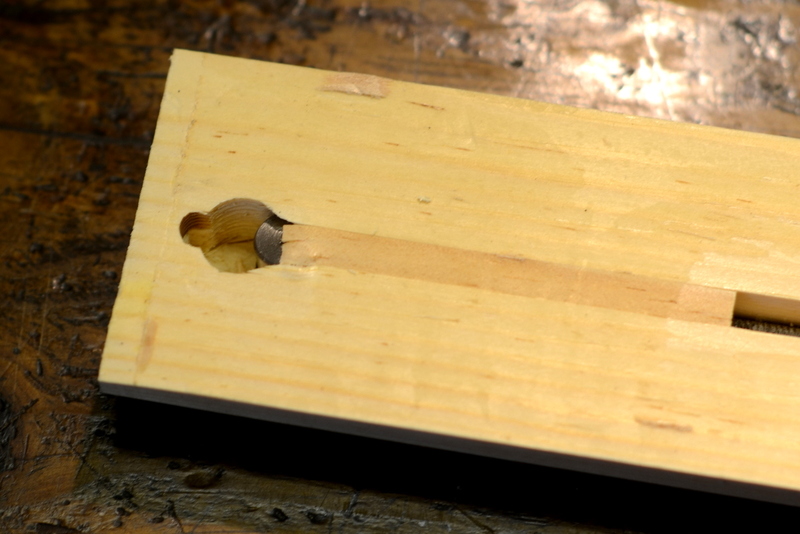 The other was that it’s 11 mm deep and, although it would be easy to rout a deep enough slot to accommodate it, there wouldn’t be room to glue a fillet over it. 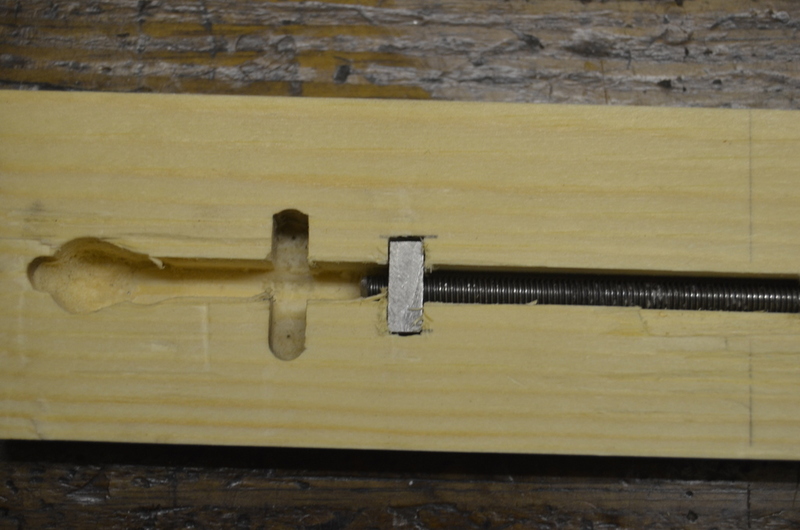 The top of the slot would have to be covered by the bottom of the fingerboard and I worried that, when the rod was tightened up it might split the fingerboard or cause a bump. 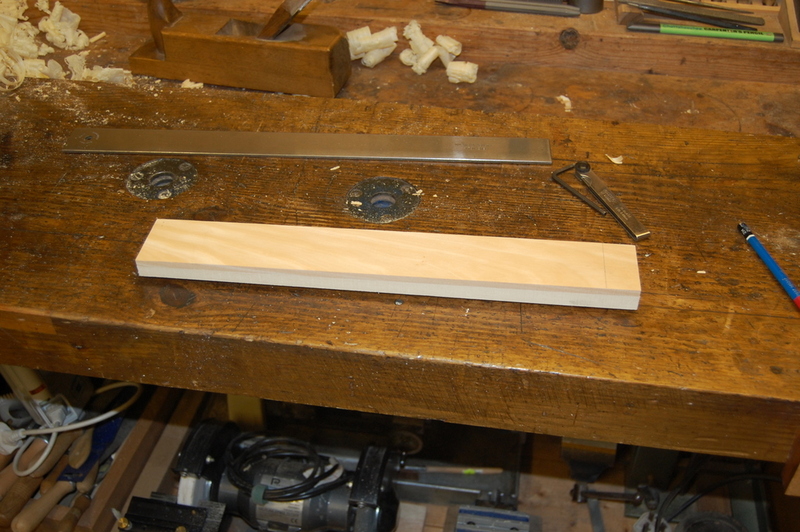 To check, I made a model guitar neck out of a scrap of softwood, routed out a slot, installed the hotrod, glued on a pine ‘fingerboard’ and tightened up the trussrod as hard as I could. It worked fine. My anxieties were unfounded: no splits or bulges in the fingerboard, even though it was made of nothing more substantial than cheap pine, and I could put a curve in the neck in either direction. Still, there’s no getting away from that fact that it’s heavy. 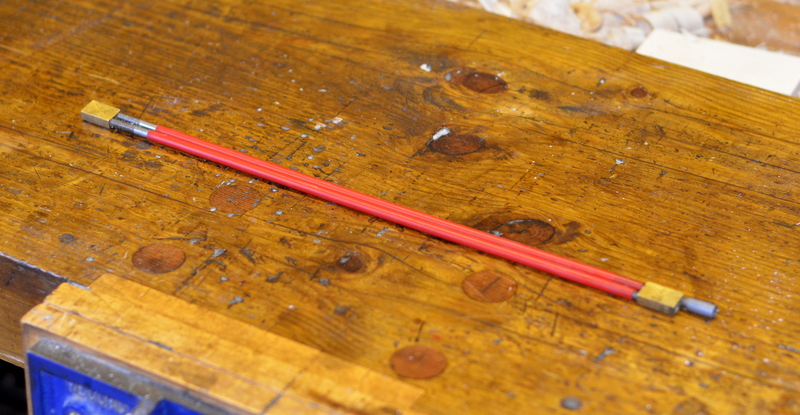 An alternative, which is less than half the weight of a hotrod, is a simple tension rod. 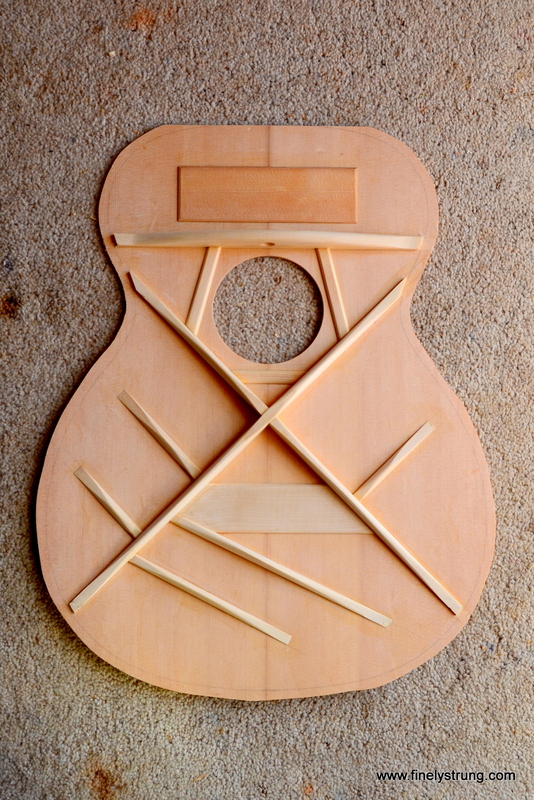 This what’s recommended by Jonathan Kinkead in his book Build your own Acoustic Guitar (ISBN 0-634-05463-5), where he gives instructions how to make and install it. 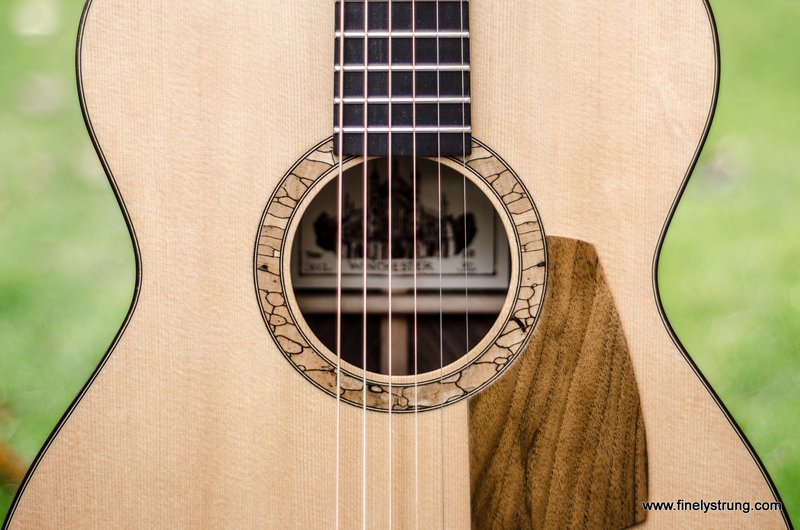 I liked this idea because of its simplicity and light weight, and because it’s easy to arrange to adjust it through the soundhole, which means that there’s no need to excavate the headstock to provide access to the nut. If you go for this solution, you have to find a way to anchor the rod at the top of the neck. 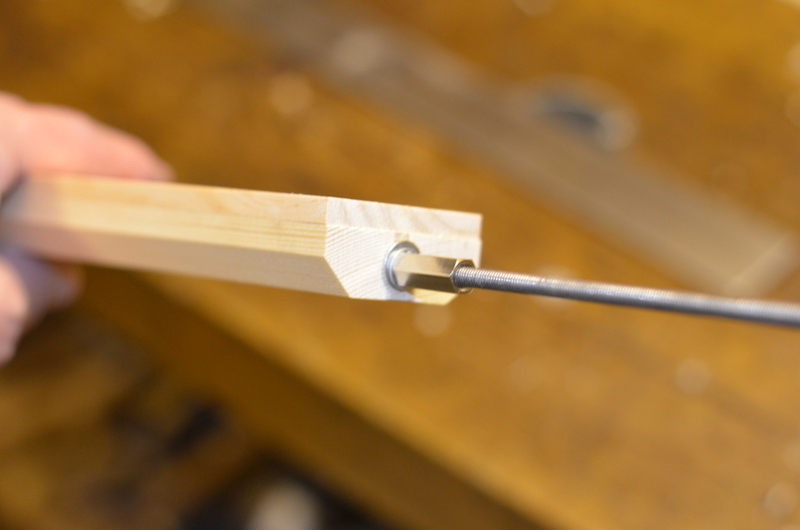 Kinkead recommends a metal dowel tapped to receive the threaded end of the rod. I made one out of silver steel and repeated the earlier experiment. 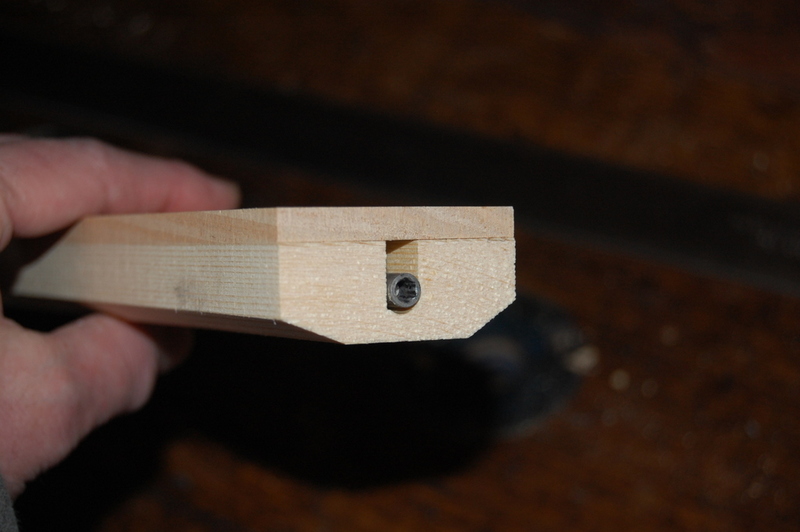 It’s easy to install, although it’s important to judge the depth of the hole for the dowel accurately to avoid drilling right through the neck. And it seemed to work OK too, although obviously it’s only able to bend the neck in one direction. However, when I took the fingerboard off, this is what I saw. The fixing at the top end of the neck had been pulled out of its cavity and had begun to travel down the neck. 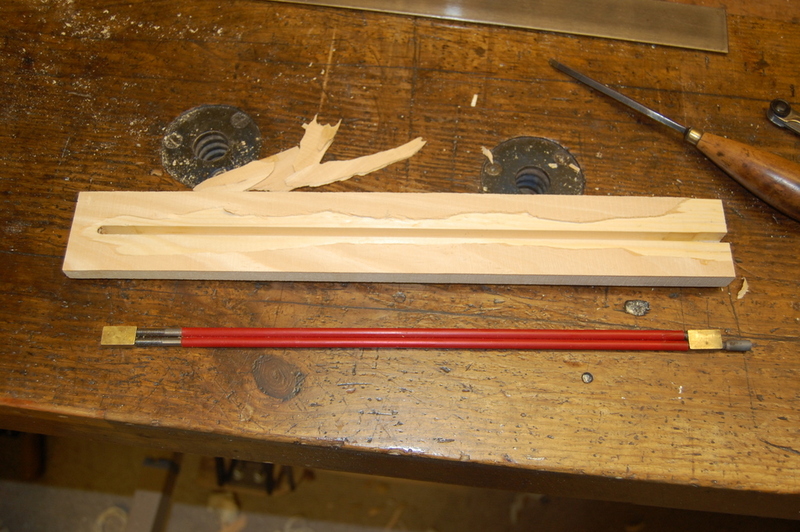 Of course, this experimental neck is made of softwood and the problem might be less severe in a real mahogany neck. Even so, I thought there had to be a better solution. It was the shape that was wrong. 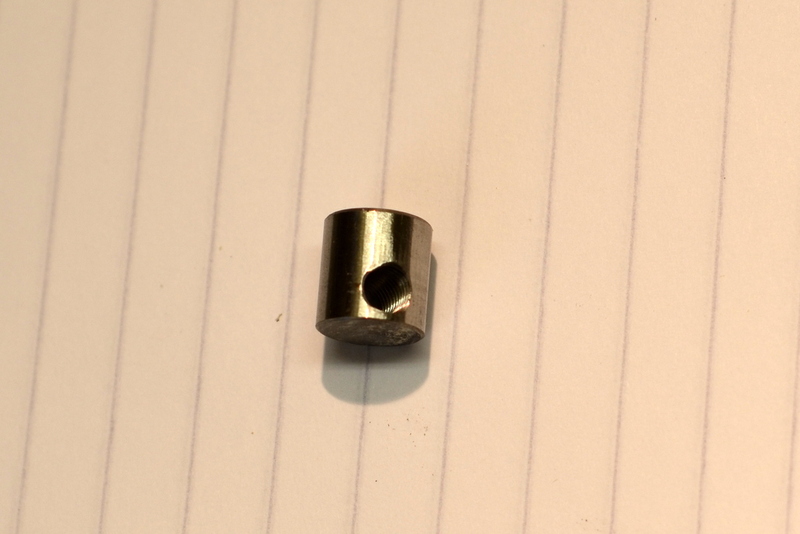 The cylindrical nut had acted a bit like a wedge. 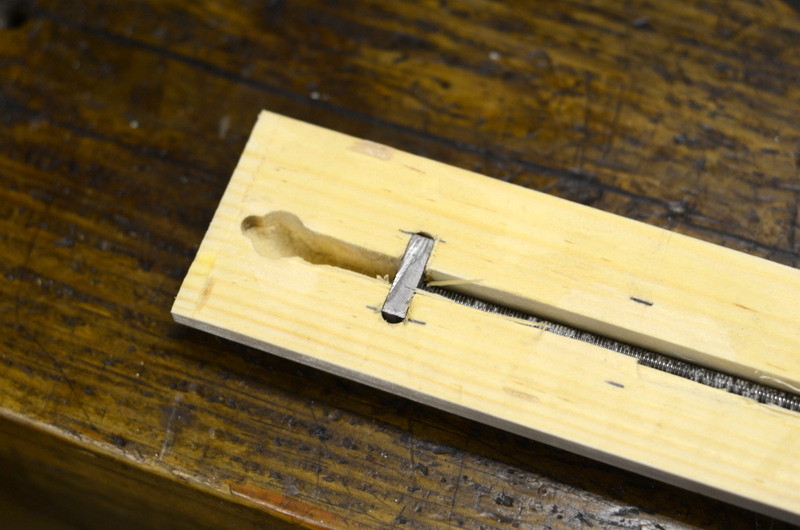 When I made a rectangular shaped nut out of mild steel, it stayed put. As you can see, the first nut was unnecessarily wide. A narrower version worked just as well. 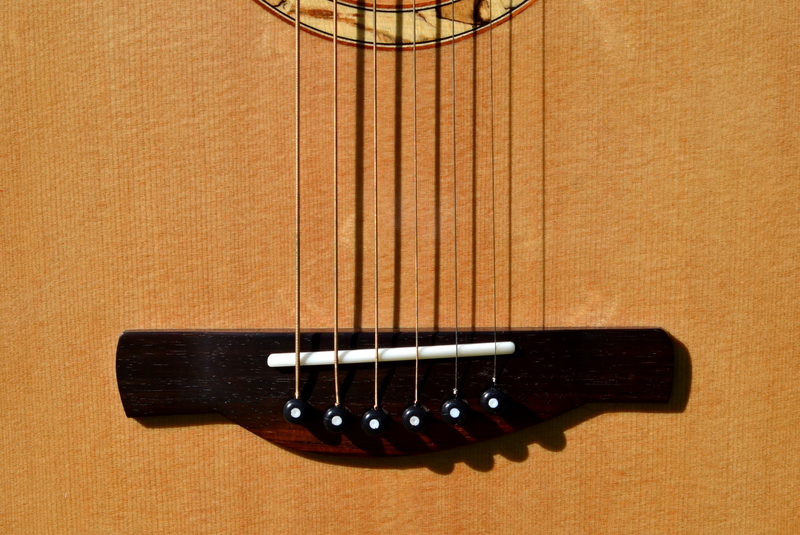 That’s what I decided to use in this guitar: a tension rod made of 5mm studding, anchored at the top of the neck with a square nut and adjusted through the soundhole. The nut at the top of the neck was silver soldered to the studding to prevent it moving during any adjustments at the lower end. 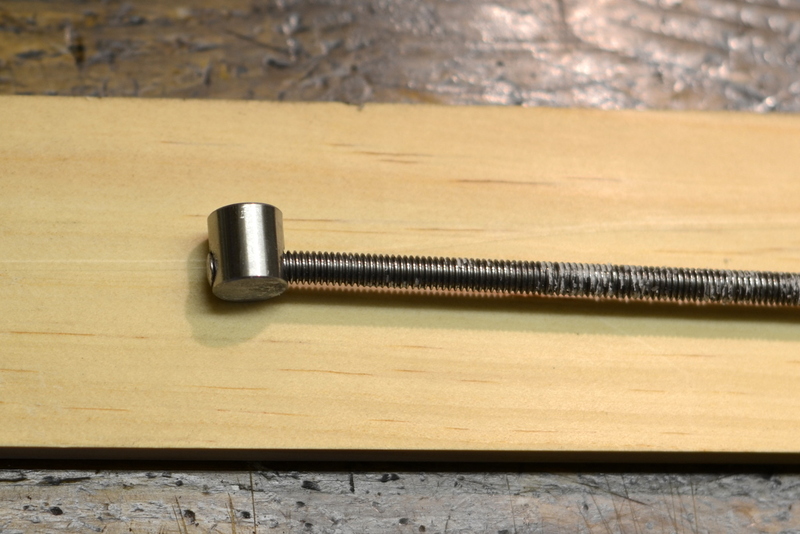 Tension in the rod is controlled by turning a 5mm column hex nut bearing on a substantial washer at its lower end. This arrangement worked well in the finished instrument and was more than powerful enough to keep the neck straight against the pull of the strings. Next time I make a steel string guitar, I shall be tempted to use 4mm studding instead of 5mm, which would mean even less weight in the neck. 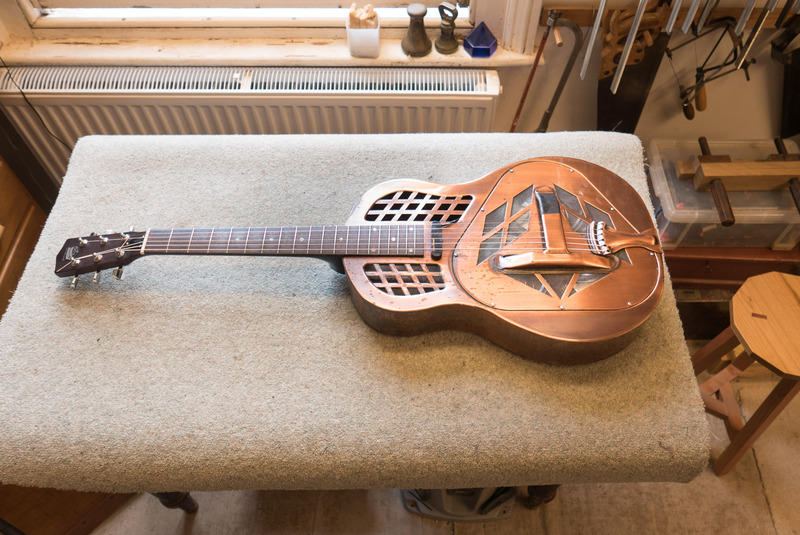 Here are a few photographs of a recently completed steel string guitar. 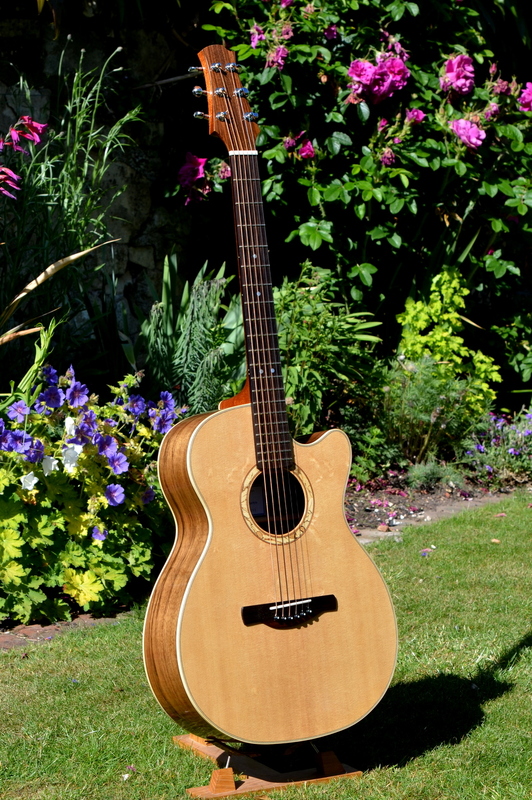 It’s based on a Martin ‘OO’ model but I’ve added, although that’s surely the wrong word, a venetian cutaway. 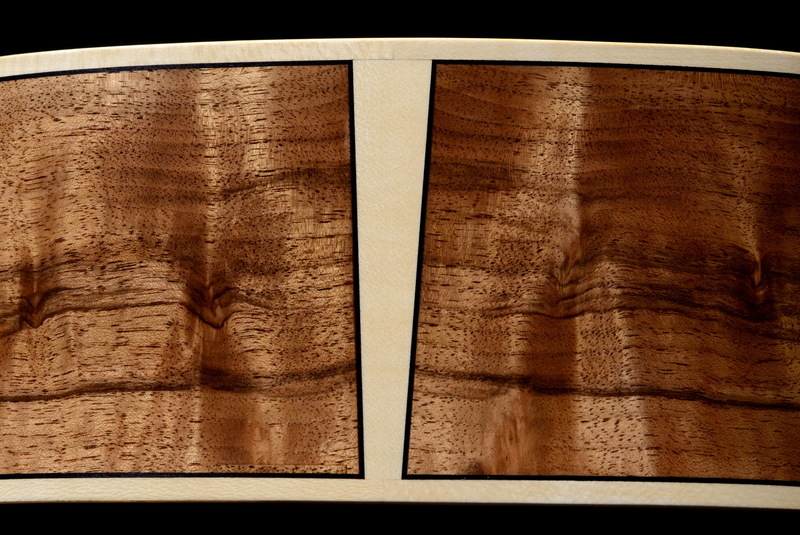 The soundboard is Sitka spruce and the back and ribs are English walnut. I used holly for the bindings and tail stripe, and Rio rosewood for the bridge. My friend, Dave Crispin, came to the workshop to try it out a few days ago and while he was playing I captured a few moments on an Edirol recorder.